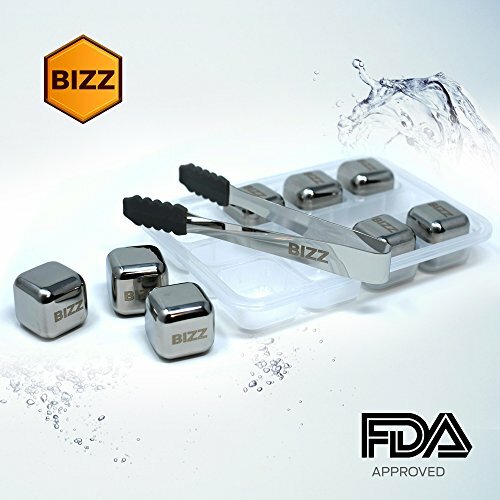 Get purer, colder, more natural-tasting drinks without watering them down with high-quality, reusable whiskey stones from Bizz. Whether you're enjoying a bit of whiskey after a hard day's work, sharing some cocktails with friends, or just enjoying a sweet soda during a backyard barbecue, you don't want it to get watered down and ruin the taste before you finish it. That's why we created Bizz Stainless-Steel Whiskey Stones that keep your drink the perfect temperature while keeping the taste pure and delicious. This 10-Piece whiskey stones set comes with eight cubes for serving 2-3 people, a freezer-safe ice tray to keep them neatly organized, and even a pair of mini tongs to make it easier to serve them without picking them up with your fingers. And because they're smooth, durable, reusable, and dishwasher safe, you can enjoy them every time you want a fresh drink without impacting the flavor. Important Note: Real ice cubes will always be colder than any whiskey stone. The freezing water melting into your drink is what changes the temperature so effectively. However, this dilutes your beverage and changes the taste. That's why whiskey stones are effective for alcoholic and other drinks, because they add a chill without ever changing the flavor. Get these premium-grade, reusable ice cubes perfect for keeping your drink or alcoholic beverage crisp, clean and not watered down by clicking 'Add to Cart' above now. Complete Whiskey Stones Set - This set of reusable ice cubes comes with 8 cubes, 1 ice tray, and 1 set of serving tongs to put a little style and class into every beverage. Maintain Drink Pure Freshness - Metal ice cubes don't melt down like frozen ice which helps keep the pure, original taste soda, alcohol, or cocktails unaffected! Reusable, High-Quality Design - Crafted with BPA-free, food-grade safe stainless steel, these refreezable ice cubes can be frozen and reused every day or every party. Smooth, Stylish Craftsmanship - Along with being rust and corrosion resistant, our mini ice cubes feature rounded edges that's gentle on glass cups, mugs and tumblers. Smart, Personal Gift Idea - A great choice for whiskey or scotch drinkers or just for keeping your drink ice cold while you're outside, get a set for yourself or a friend! If you have any questions about this product by Bizz, contact us by completing and submitting the form below. If you are looking for a specif part number, please include it with your message.